Hello. I've popped on to share this weeks DigiStamp Boutique card. 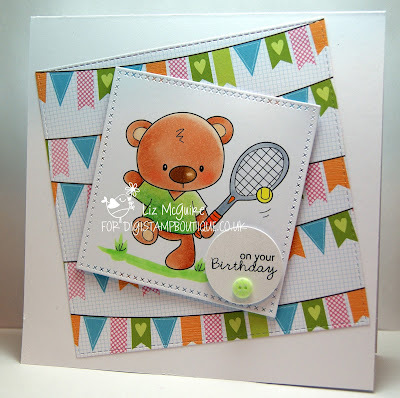 It features Cute Ted playing tennis - very appropriate for this week. He is from the Cute Ted - Sports set available here. I coloured with Copic marker pens and the paper is 'Meadow Sweet' by Craft Asylum. All pieces cut using MFT dies and my new baby! On that note a few crafting buddies here in blogland and on facebook have asked what I think of my new machine - a Big Shot plus. Well, I adore it, it's fabby! But then I have only ever had one machine in all my years of cardmaking and that was my trusted original Big Shot. So, if you are thinking of switching or upsizing I highly recommend a Big Shot plus. This is brilliant Liz, glad you are giving the new toy a good workout!! Fabulous card Liz.....he's a winner! Glad you are enjoying playing with your new 'baby'!